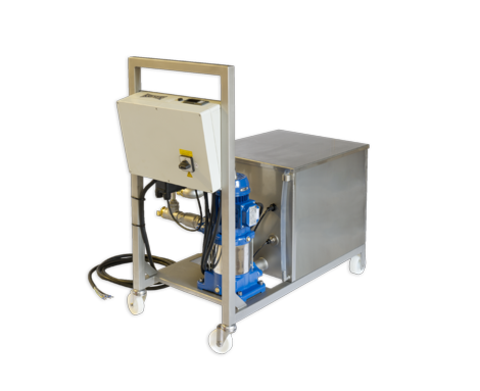 The steam generator TopHeat is conceived for the production of steam for cleansing and sterilisation of tanks, barrels, pipe systems, cellar equipment and fittings, filters and filling units. The units are made of stainless steel and they are mobile due to their rolls. They are perfectly suited for small wineries, breweries and other beverages producers. 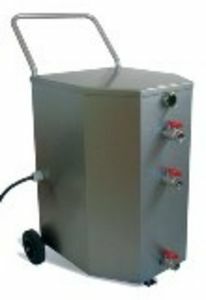 The water in the TopHeat’s reservoir (40 liters, or 20lt by half-fill level) is heated up until steam is created. The heating-up time takes about 15-20 min (40lt by model TopHeat18). After the heating at top capacity, use the switch to decrease capacity during the cleaning operation. Operation time for TopHeat 18, for example: approx. 1 hour by full capacity 18kW, and 1,5 hours by 12kW operation capacity, until the container runs empty. The TopHeat can then be re-filled and re-heated to continue its operation. TopHeat is available in three models, with capacities of 12 kW, 18 kW and 24 kW. In all models, after heating at full capacity, decreasing capacity for operation is possible (using the unit’s two-position switch). Operation pressure should not exceed 0,5 bar. The TopHeat is equipped with a safety pressure valve that opens at 0,8 bar. Steam overflow is evacuated to the floor.